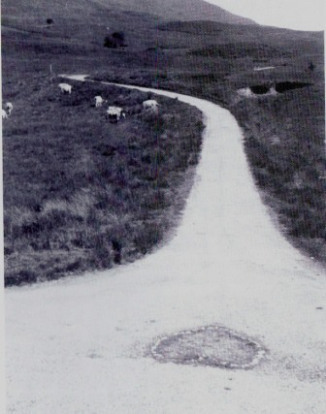 The Tinker’s Heart is a small arrangement of white quartz stones embedded in the ground at the junction between the road to Strachar (A815) and Hell’s Glen (B839) in Argyllshire. For years it has stood as a testimony to the survival of Scotland’s Travelling people. A sacred place where couples wed, babies were christened and the dead blessed. In 1872 there is proof of two local people getting married there. There is no written evidence as to how old it is and like the oldest ballads that Burns listened to, it is all oral – no dates nor names. 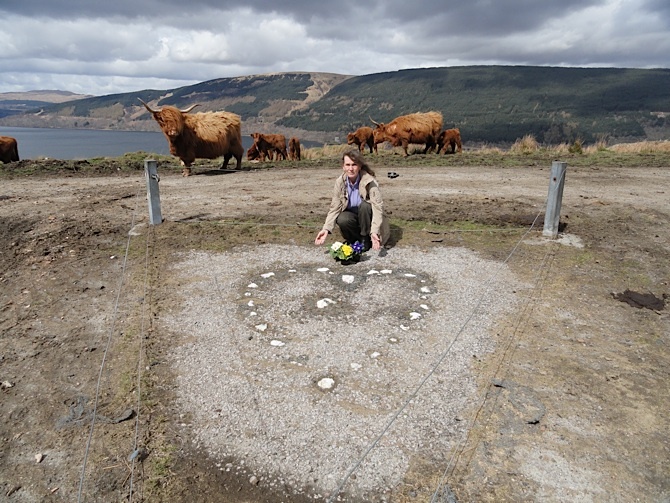 Reasons for the stones being placed there are associated with the Battle of Culloden and the Highland Clearances as well as the eradication of the Culture by removing children from campsites. It is sacred to my people from all over the world and needs to be protected and restored. Several years ago someone told me of the sorry state of the Heart. A visit had me in tears. Highland cattle were trampling over it, a single strain of wire threaded through three metal poles was all there was to protect it (see picture above). It was dying and I had to save it. I needed help so contacted my local MSP, Mike Russell. He was excellent and he set up a meeting with Ms Howe but was not prepared for her negativity. He’d not come across her attitude before. I presumed by his reactions that this landowner did not hold Travellers with much respect. Here is a rich landowner who owns 7048 acres of Scotland yet is not prepared to part with a few yards of old road. Every step seemed to be getting harder. I went to visit a couple representing the landowner with Mike but got no joy there. Another meeting, this time at Argyll and Bute council headquarters with Mike Russell, Councillor Louise Glen-Lee, the Council’s tourism officer and a gentlemen from Historic Scotland, resulted in more negativity with Historic Scotland stating they would allocate funding for restoration but only with the landowners approval. Two years moved fast the little heart was crying for help! Then out of the blue a black cage was erected over the heart (see picture below). 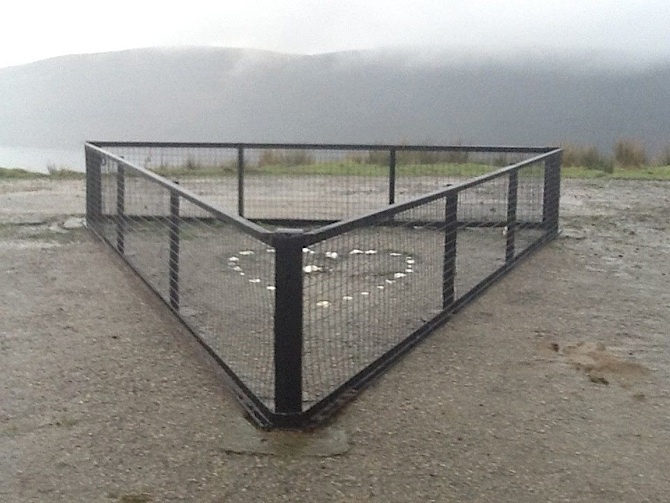 I was pleased to see the ‘heart’ caged and safe but it looked more like a prison than the decorative stone wall and cairn I’d long visualised. While it remains in Kate Howe’s ownership it is very vulnerable. it has no legal protection and at the stroke of a pen she could develop the area, its a prime spot and I feel she just might have her sights on such a plan. But even if she didn’t, she will in time die as will I. Who will care for the place then? No – this has to belong within the public domain. I contacted the Scottish Parliament to lodge a petition. Four months passed and each time I phoned the reply was “not petition material”! However Mike Russell managed to convince them of the history and importance of the site to Scotland’s culture. Just before Easter came the news that the petition will go live!! That is how things stand today. Our ancient culture, timeline, respect and historical truths are now at this final stage and I am praying to Mother Earth to do what is right. If we are failed then Scotland’s future will be at the mercy of wind farms, shooters of our wild life, greedy strangers, land fracking and nimbys with lots of cash. Please sign the petition. You can find further information on the petition page and at the Saving the Heart of the Travelling People facebook page. The Royal Commission on the Ancient and Historical Monuments of Scotland has a record here. (1) Content here has been removed but relates to the comment from John MacDonald below. 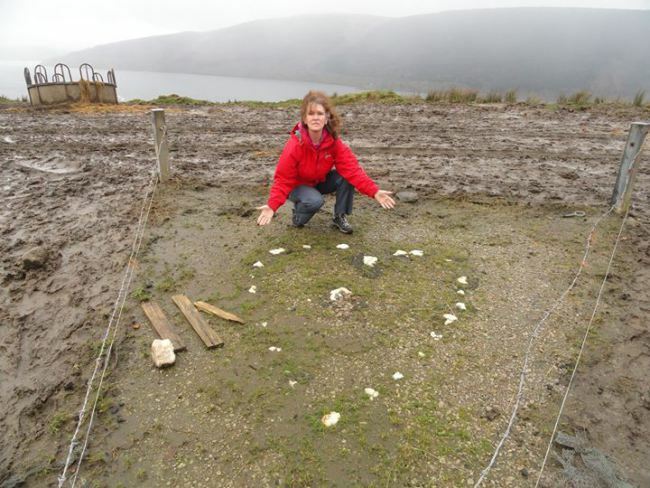 Last year, in a series of blogs, I highlighted a number of issues relating to Ledgowan Estate – in particular the controversy over the construction of an ugly bulldozed track. The story was promoted by an incident over public access which arose during an inspection of the track by Dr Kenneth Brown who was investigating the track as part of a research project by Scottish Environment Link. Its report – Track Changes – was published in October 2013 and called for hilltracks to be subject to full planning control rather than the existing system of Permitted Development Orders. A Parliamentary Briefing can be found here and the full report here (5.3Mb pdf). “We find Scottish Land and Estates’ statements in their report about scrutiny and LINK’s charitable status strange and inappropriate. The issues raised in the Track Changes report fully comply with LINK’s charitable purposes and funding for the report was received from member contributions and charitable trusts. It is entirely proper that LINK uses its funds for this purpose. In the Spring edition of the SLE’s magazine, it argues that voluntary guidelines are adequate and urges its members to follow them. Meanwhile, a wee bit of history. One of the tracks that attracted a deal of criticism over the years was the one up Beinn a Bhuird in the Cairngorms. It has now been restored by the National Trust for Scotland but here’s an article from the January 1968 edition of Scottish Field explaining the background and purpose of its construction in 1966. 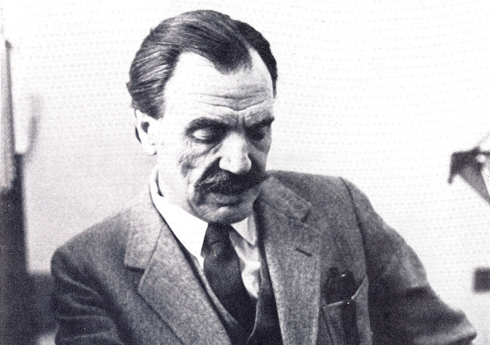 Ian McHarg died this day in 2001 (NY Times obituary). He was a Scottish landscape architect who made his name in the University of Pennsylvania where he founded the world famous Department of Landscape Architecture and Regional Planning in1955. He was born in Clydebank in 1920 and (for those with an interest in the history of mountaineering in Scotland), was one of the Craigallian Fire men. Arguably his most famous legacy is his 1969 book, Design with Nature. 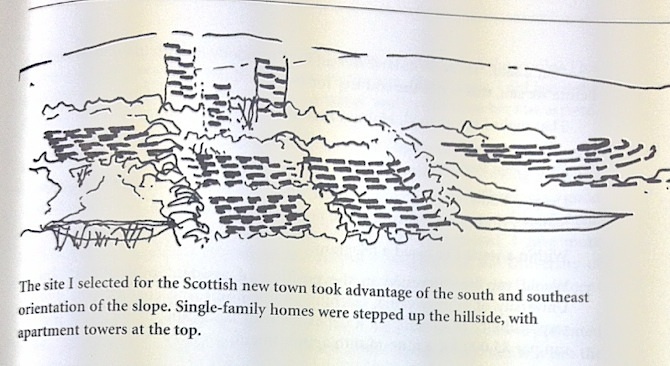 One of his pupils and collaborators in the project was the Scottish landscape architect, Mark Turnbull, who is still practising in Scotland today [EDIT – Mark sadly passed away in May 2016 – obituary here]. His book sat on the shelves of my Dad’s study when I was growing up. He was an architect and, as a student, I thought it would make an interesting contribution to the forestry course I was doing at Aberdeen University. However, so dismal was the outlook of the staff there (there were a few honourable exceptions), that the notion of even reading such a book was regarded as too radical. I read it though and recommend it to anyone with an interest in environmental and spatial planning (McHarg invented the sieve mapping technique now standard in GIS – the European Geosciences Union awards a medal in his honour). 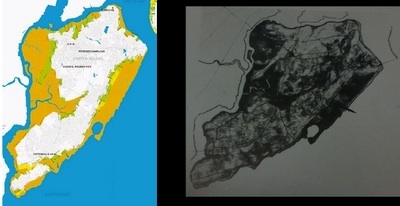 His vision of how to understand ecosystems and undertake regional planning was so advanced that, as this blog notes, he predicted the areas unsuitable for urbanisation on Staten Island (dark shading on right). He was ignored and those areas match almost exactly the evacuation zones (in yellow left) at the time of Hurricane Sandy (see below). One day I was summoned by the chief of the new towns section, an architect named Alex Wylie. East Kilbride and Glenrothes new towns were underway. There was considerable interest in yet another; both the cities of Glasgow and Edinburgh thought that a site near Cumbernauld, between these cities, should be investigated. However, it was likely that this new town would be a satellite of Glasgow and administered by her. Would I undertake the study? I immediately visited Cumbernauld. It had the virtue of proximity to the major highway connecting Edinburgh and Glasgow. As at East Kilbride several years before, the wind howled, the rain drove horizontally, the whole site was awash. Morevoer, the farms were few and scattered. Anthropologists long ago had learned that sparse human settlement bespeaks adverse environments and impoverished resources. I spoke to several farmers whose opinions were united. It was a miserable place, wetter than most, with intractable mud, poor soil, a high water table, few trees, and those wind-pruned. 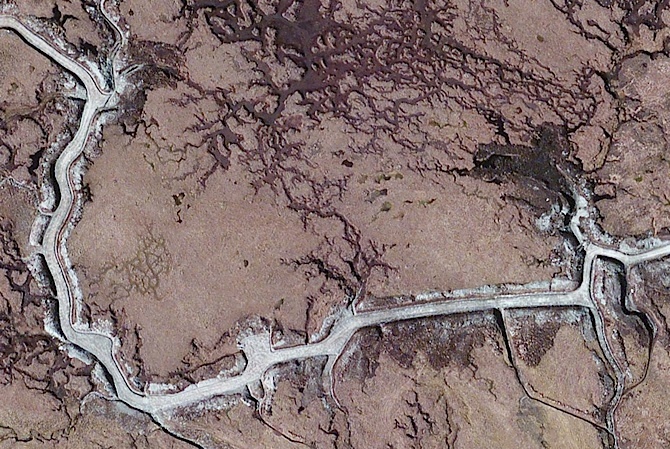 The ideal site, in classical and Renaissance times, was a southeast-facing slope. That could not be found on the Glasgow-Edinburgh road nor on the south of the Clyde, but north of it were admirable classical sites, south and southeast-facing, at elevations above fog with beautiful views to the Firth of Clyde and, south, across the Clyde, to the Renfrewshire Hills. On the day I went there, the sun was shining; protected from the wind I lay in heather and exulted in the views. There was Dumbarton Rock, a volcanic cone with a ruined castle atop, ancient capital of Scotland, the gleaming Clyde, and , far out beyond the estuary, the Paps of Jura. There was one problem; the site was steep. Now this had halted neither Rome, Siena, Frascati; nor San Francisco. This constraint must be transformed into an opportunity; we are not building for popes or cardinals. I recalled a project in Zurich, the Neubuhl, by Haeflie and Moser, where housing stepped down a steep slope and the flat roof of the lower house became terrace, balcony, and garden of the upper house. This would be the answer. 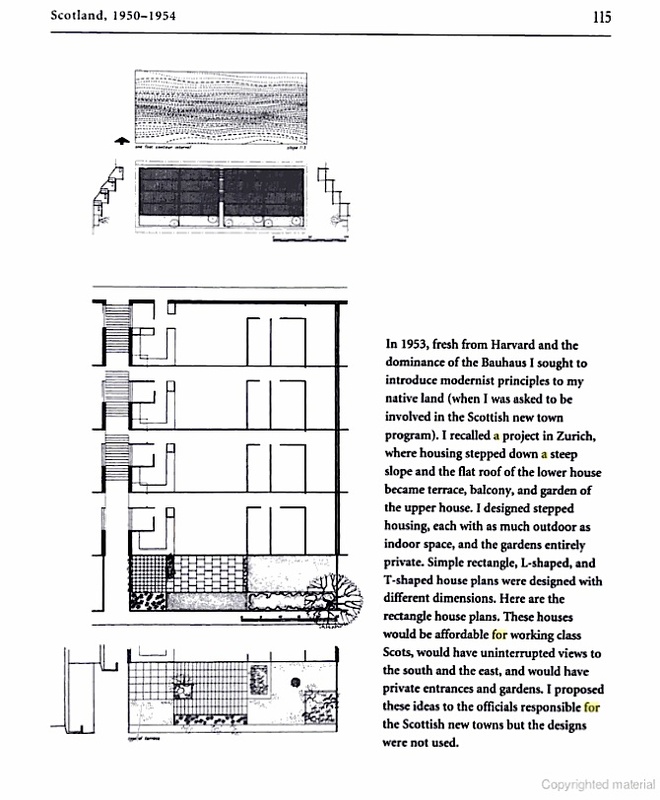 Hanging gardens, stepped housing, each one having the merits of an attached single-family house, each with as much outdoor and indoor space, and the gardens entirely private. If the block was to be composed of four houses in depth, then the occupants at worst would walk down three flights or up one. In city where the commonest house form was a four-storey walk-up tenement, this was not a serious objection. So house plans developed, simple rectangles, L-shapes and T-shapes with different dimensions. They were all modular and could be fitted in various permutations, but all had uninterrupted views to south and east and all had private entrances and gardens. Open space equalled the building area. On the skyline, out of every view but overlooking the whole, were towers and slabs for older people, single households, and couples without children. The towers provided views of a landscape of gardens. McHarg goes on to describe the detailed design, “extraordinary economies in construction costs” and the energy efficiency. I submitted the plans to Alex Wylie, chief architect for new towns, who then arranged for me to present the material to the permanent undersecretary, Mr McGuiness, an Irishman with a Scottish accent. Wylie introduced the idea and gave his endorsment. I was asked to add my remarks. I spoke glowingly of the hanging gardens, the morning-golden windows, the beautiful views, access to workplaces on the Clyde, proximity to Glasgow, the beautiful landscape setting and, above all, of the greater economy of this scheme as compared with conventional bulding. There was a long silence. He was immediately offered a position as an assistant professor to set up the Department of Landscape Architecture and the rest is history. A small ceremony was held before my departure, at which time I was presented with a handsome briefcase. Kind words were said. I decided that this was not the occasion for criticism, thanked my colleagues, wished them well, and left. PS McHarg’s Wikipedea entry is very good account of his life.